The U.S. Department of Casio announces the watch with a mesh texture. 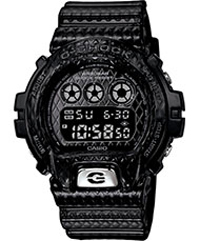 Funky design gives the model G-Shock special uniqueness and strength. Mesh design has been achieved thanks to the 3-D paint technology around the watch case and bracelet. Such a structure, together with a silver button G – another beautiful piece stylistically DW6900DS-1.